During the first night post-surgery, Nina woke Dylan up every two hours to go through a battery of tests and checks. "On a scale of 0 to 10, with 10 being the most pain imaginable and 0 being no pain at all..." she began, repeating the same drill we heard just a few hours earlier. "Can you wiggle your toes?" she continued, as the toes began moving around, first the left then the right. And just as easily as he awoke, he slipped back into sleep as soon as she covered up his feet, tucked in the blankets and walked away into the dimly lit hallway. Several times over the past 24 hours Dylan's pain edged up into the 10 range. Tired, frustrated, aching, he reached for my hand and pulled me in. I stroked his forehead, like I did when he was a baby, though he is now a young man. His long flowing hair feels nice, as I push it away from his ears and back over the top of his head. 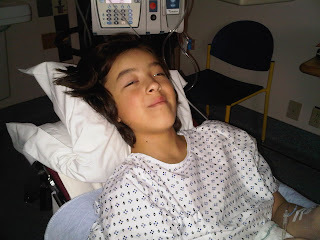 The cries subsided as the morphine kicked in and he was asleep again. The first several days after an orthopedic surgery are all about managing the pain as the bones and tissue begin to recover. Connie, the daytime nurse, shared that things were very different with pain management when she graduated 25 years ago. "In those days you'd get an injection in the hip," she said. "And you'd have to wait four hours for another one, no matter how much pain you felt." Now, pain management is a carefully constructed stew of morphine, Valium, and other delights designed to minimize delusions and discomfort. Dylan has a little button called a PCA (Patient Controlled Analgesia) that he can press to release extra doses of morphine when the regulated stew proves to be insufficient. We both slept in fits and starts through the night, Dylan in his super-slick fully-automated hospital bed, me on my single mattress next to the window. Eventually, all the beeps, chirps and alarms faded into the background and became part of the nocturnal sound scape and we slept.